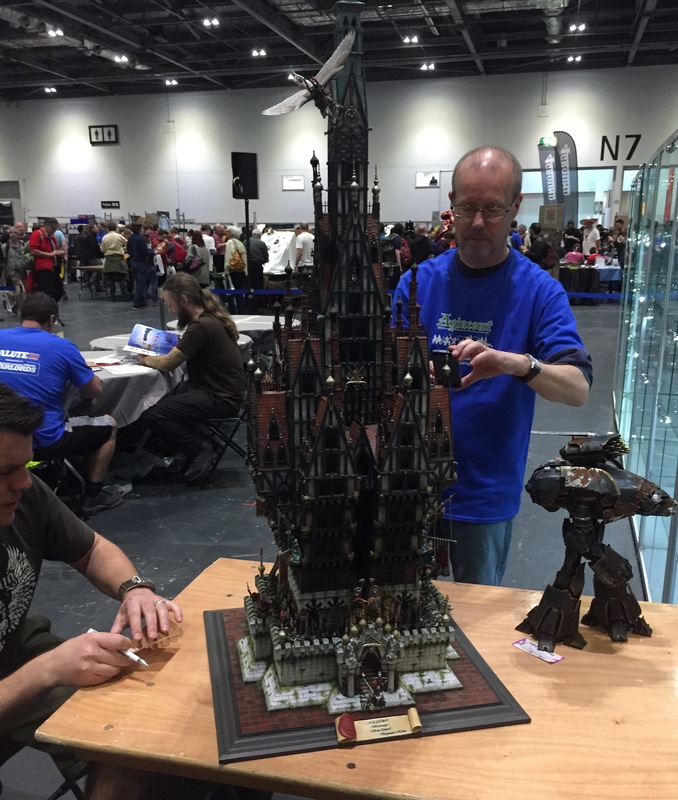 On the sunny Saturday just passed, I and my good ol’ buddy, Henry South of 4gotowar, boarded several packed trains to travel the breadth of London to the capital’s leviathan of an exhibition centre, the Excel, for Salute – the premier wargaming convention in the UK. In this post, I’ll let you know about plenty that I saw there and as much as I can remember too. This is my third Salute in a row, and I feel I should set the stage for those of you who have not had the pleasure. It’s huge. An aircraft hanger full of myriad stalls, sales booths, demo tables, display boards and much, much more. And there is a sea of enthusiasts interested in every aspect of the hobby, from historical wargaming to boardgames and everything else. Here’s a shot to give you an idea of scale. 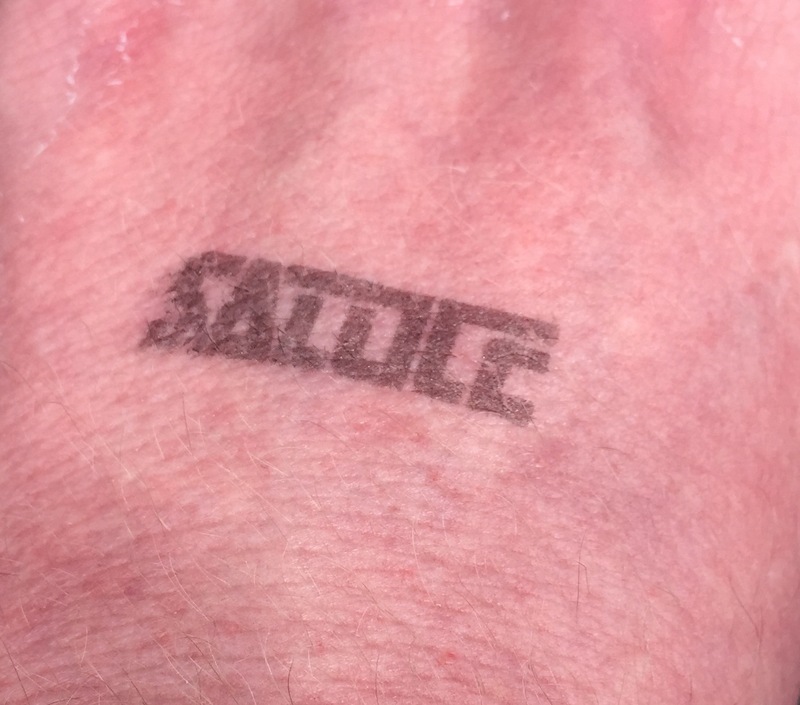 When you get there (provided you’re early enough) you get a bag full of brochures, a single branded die, and maybe even a model – I got a bowman that, while useless to a confirmed boltgun-enthusiast such as myself, is a nice gesture and I appreciate that. The one free gift that wasn’t welcome was the sheer level of BO going on that day, but I can’t hold the organisers to account for that. However, as a community, can we all remember that especially on hot days, deodorant is our friend. There were some really cool display boards up this year, from Mayan Temples to Agincourt itself, but I picked out my favourite here; Hoth in all its glory. 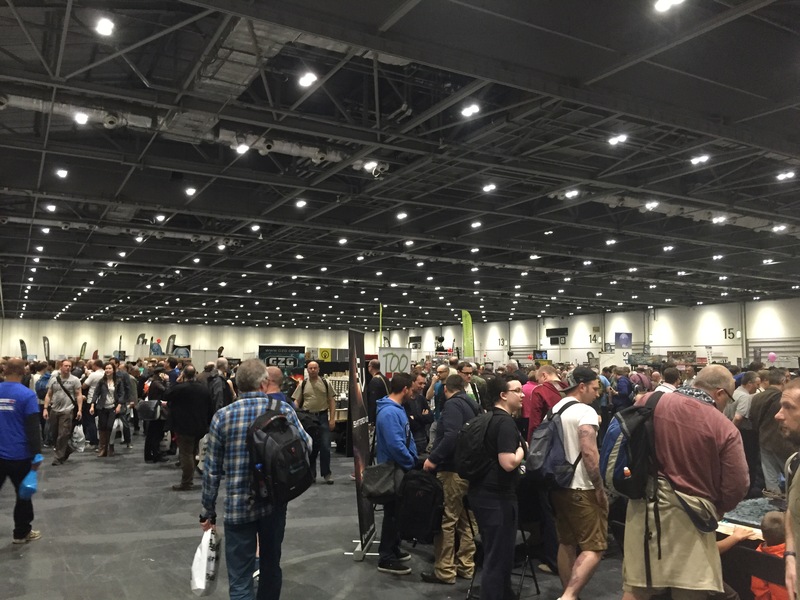 Of all the stalls, the busiest by far was Forge World’s with a queue stretching almost the length of the hanger. This might have been because, despite knowing that they’d be so popular, they bought only a handful of staff who were beavering away nobly and manically trying to keep everyone happy. They also ran out of plenty of kits (which is why one of mine is on order and not on my desk!) so I’m sure lots of folks left without the titan or superheavy they wanted. I did pick up the Mk IV weapons upgrade kit that I’ve wanted for a while, so that’s nice. MDP – Model Display Products are a great site to know about especially if you want to start entering painting competitions or even if you just want to give your minis a nice home. They do (amongst other things) some great, affordable display plinths and I’ve picked up a couple myself. What’s more, the guys who run it are friendly and very helpful, so a big win there. Anarchy Models – Now, I’m not an airbrusher as you know, but I know a good stencil when I see one and these guys had bucket loads of them. You might be seeing some of them going to help Henry on his blog as he made a couple of shrewd purchases there. Again, really friendly, and really (justifiably) proud of their wares too. Zinge Industries – These guys are great to know about, and were very helpful on the day. All those little bits and pieces you didn’t know you needed, from individual ammo rounds to gas canisters, from flexible resin to powerful chains… hell, there’s loads of it. Go check it out. Peripherals abound. 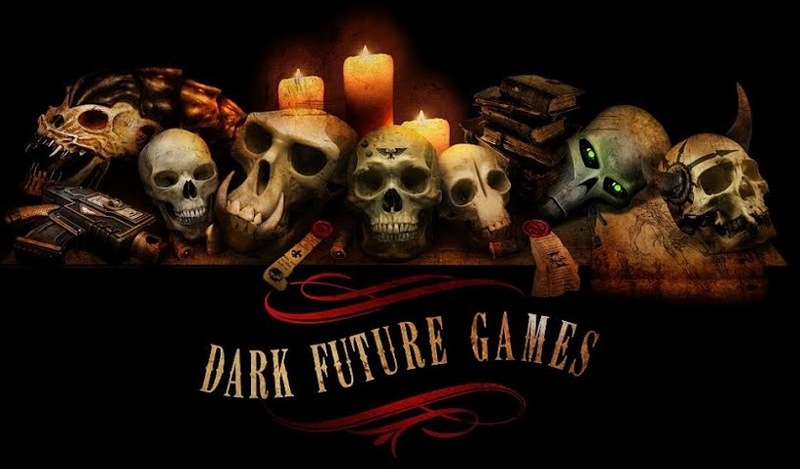 The Dice Bag Lady – She’s becoming a Salute favourite, and her wares are now highly sought after. Check out her stuff and treat yourself to a nice new home for your dice. The painting competition had some really nice pieces too. Alas, a good display cabinet has a habit of screwing royally with an iPhone camera, so you may need to enlarge these images to discern what’s going on. 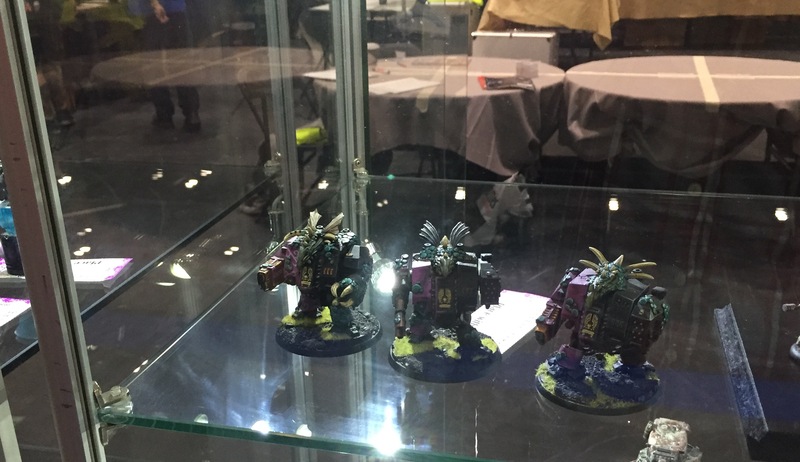 The above features three Slaaneshi dreadnoughts which I obviously had to snap. They looked great though, due to the hidden ticket, I don’t know who to credit – whoever you are, well done! 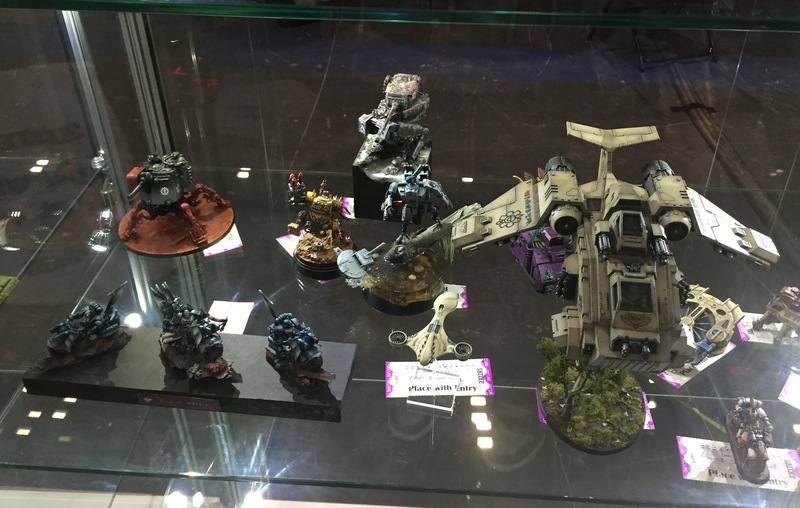 But there was plenty of good looking stuff going on from 40k enthusiasts too. Here’s a couple more. Oh, but there was one piece in the competition that really stood out. Again, I don’t know who did it and would love to offer some credit so if you know, drop a comment below. And that’s a Reaver Titan next to it for scale. It’s so detailed and just plain amazing. Well done to the wargamer that put the hours into that. The day involved a lot of walking and talking, and thankfully a couple of pints in the afternoon. I’m still soaking my feet in hot water after all that browsing and bartering. But I’ve got my plinths and close combat weapons, so I’m happy with my haul and looking forward to Salute 2016. Big thanks to South London Warlords for yet another great event. 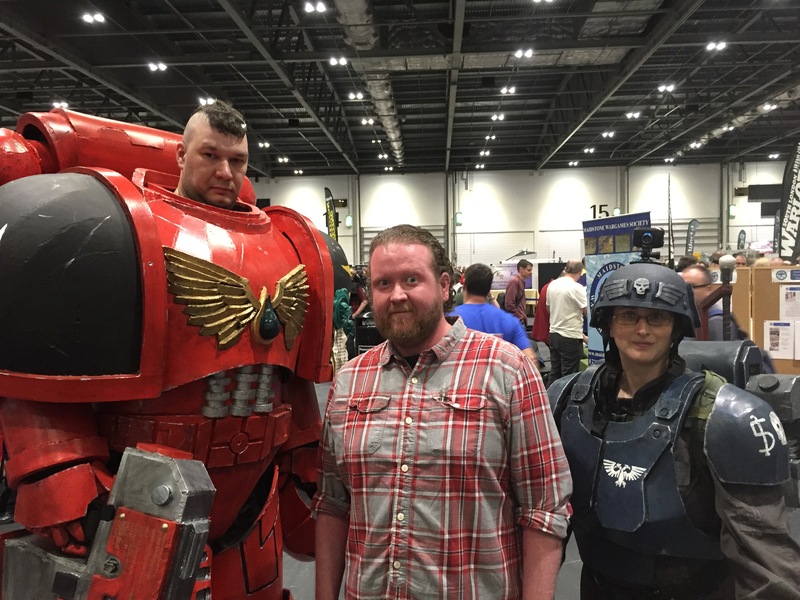 I shall leave you with an image of myself (centre and looking like a heretic at an Inquisition mixer) and two of the other stars of the convention (seriously awesome costumes). It’s also worth remembering that I’m 6 feet tall here. Onwards! 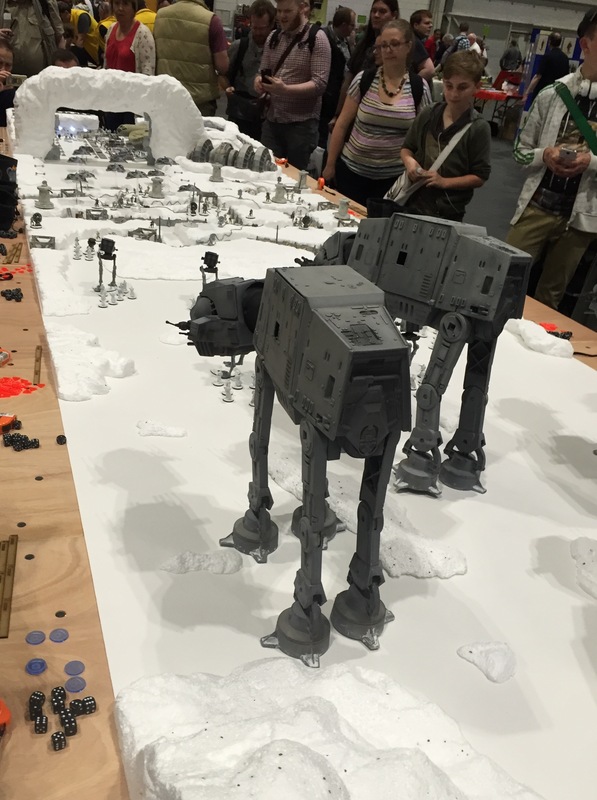 Man, I so missed that Hoth board, it looks amazing, I attended for a while myself, until it got to hot and stuffy and I had spent all my cash….. I thought that Vader and the troopers were dummys! damn they were standing soooo still at the start LOL. Yeah it sucked that FW’s stall was so in demand, I really wanted to get the even specials, oh well. 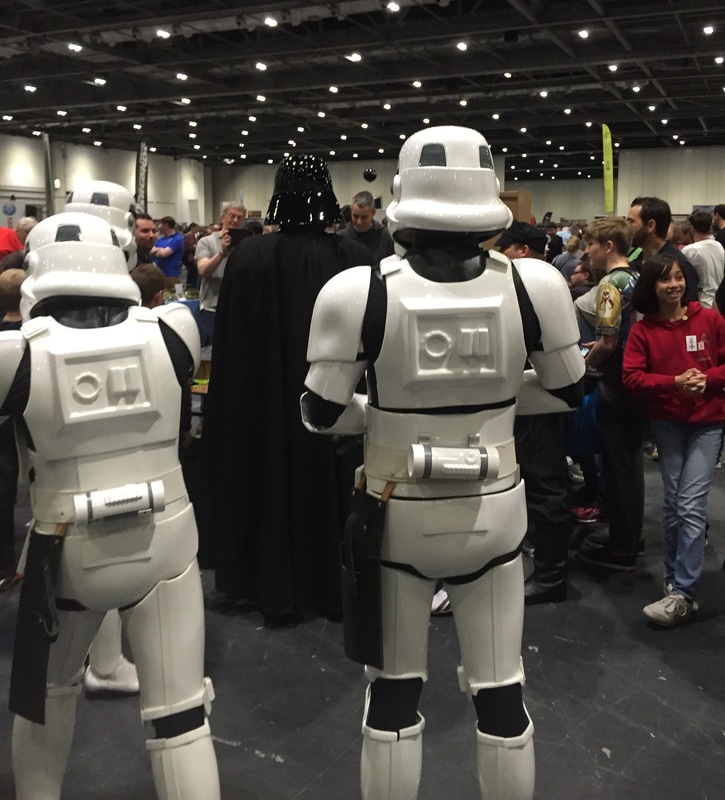 Did you see the Battlestar Galactica space battle demo, and they sailing ships attacking the fort, amazing displays…..
Oh that Space Marine was a star! saw him cheering up some small wargaming tikes during the event.